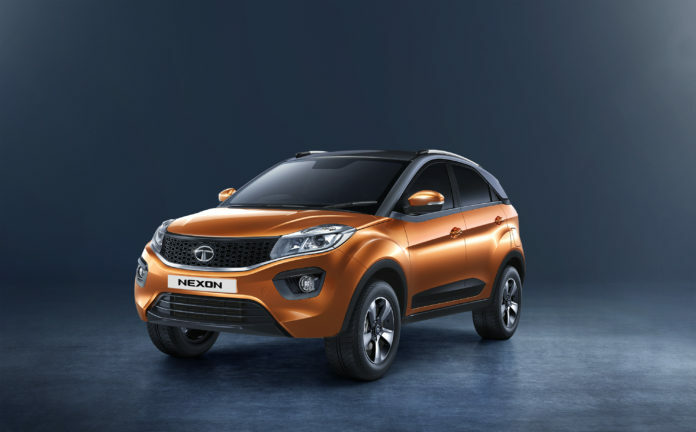 Tata Motors has started accepting bookings for it’s upcoming Nexon AMT from today. The booking amount has been set at Rs. 11,000. The launch of the car is expected to be sometime in May. With the unveiling of Nexon AMT, Tata has also rebranded all its two pedal cars as Hyprdrive and the AMT gearbox is now termed as Self-Shift Gears (S-SG). TATA Nexon Hyprdrive with S-SG will be powered by a 1.5L “Revotorque” turbocharged diesel engine producing 110HP & 260Nm torque. It will also be offered in a petrol version powered by a 1.2L “Revotron” turbocharged petrol engine which produces 110Hp and 170Nm torque. Both these engines will come mated to a 6 speed AMT gearbox. Both the diesel and petrol version will get three drive modes in Automatic mode namely Eco, City and Sport. Will get a new dual tone “Etna” orange with “Sonic” silver roof colour option. A “Crawl” function is also offered, helping the car to move forward at a set speed without pressing the accelerator. It will aid driving in bumper to bumper traffic. “Smart Hill Assist” to prevent the car from rolling back while going up a slope. It will also feature a manual mode for gear shifts. Using this will automatically put the car in “Sport” drive mode. The Nexon Hyprdrive with S-SG will only be offered in a top end XZA+ variant and will get all the features of the XZ+ variant of its manual sibling. Once launched, it will compete against Mahindra TUV500 AMT and Ford Ecosport AT in the market.